The Tempra continually heats water instantaneously as you require it - and only when you require it. The Tempra unit completely replaces a conventional tank heater with no disruption to your comfort and hot water needs. The Tempra™ continually heats water instantaneously as you require it - and only when you require it. The Tempra™ unit completely replaces a conventional tank heater with no disruption to your comfort and hot water needs. Electric tank type water heaters are subject to stand-by losses which amount to 15 - 20% of the kWH used. In addition, water in a tank has to be heated hotter than necessary to account for these stand-by losses. Changing to a tankless system like the Tempra™ eliminates these problems and results in typical savings of at least 15 - 20% on the heating portion of your electric bill. The Tempra™ takes up considerably less space than conventional tank type water heaters and saves valuable living space. The Tempra™ has several advantages over a gas-type tankless water heater. Compared to many similar gas tankless models the Tempra™ is less expensive to purchase. Installation is also much simpler and cheaper since it is not necessary to vent a Tempra™ to the outside. By nature of the design, the Tempra™ is nearly 100% efficient; converting 100% of the electrical energy it consumes into heat. All that heat is then transferred to the water - none is lost to the outdoors. Stiebel Eltron has an enviable track record of engineering excellence and product quality. The three years parts warranty is unique in the industry. You can depend on the Tempra™ for many years to come. Take the cover off - our quality is evident. 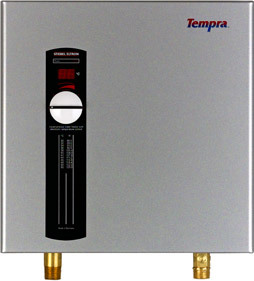 The Tempra™ is a tankless water heater system, and is thereby not subject to seismic code. There is no need for preventative construction, as required when using a tank type water heater. The Tempra™ has several temperature and flow sensors which feed their readings into the unit’s proprietary microprocessor control. Heating elements are engaged in stages, achieving the temperature you desire. The Tempra™ continually monitors the water temperature it produces. Tempra 12 - What Size do I need? Tempra 12 - What Electrical Requirments do I Require? Please be aware that uninstalled units returned due to a home that has inadequate electrical service may subject to a re-stocking fee.